Don’t eat anything with a face a mother could love. You’d think this phrase was only the slogan of the vegetarian, but I can almost hear the bane to sound wildlife conservation rear its ugly head even in hunting circles. That’s where in lies the apprehension of even the hungriest hunter when the topic of culinary conversation falls on the bear. Everyone’s willing to go out and blast a buck, or drop a duck. They might even do the proper work of thinning out coyotes. But will they drop the same hammer on a large Teddy bear? “Oh it just looks too much like a human when it’s skinned,” is the other retort frequently used. Now, if Fish and Game used these emotionally driven ideas to run their wildlife management programs we’d be in real trouble…wait a minute: they do run their programs based on emotional responses by the public! Not that the research isn’t there provided by biologists. It’s just that in California, the DFG doesn’t want to ruffle too many feathers: they do have to get paid…but should their pay be based on how they make people in San Francisco and Los Angeles feel all warm and cuddly? Or, should they be taking care of a predator population gone rampant, while the major prey dwindles due to too many deer tags sold for deer zones, Mexican cartel growers setting snares and booby-traps, lack of burning for fawn protection and increased food potential (USFS/BLM is terrified of getting sued by homeowners if their home accidentally burns down), and major mountain lion populations left unchecked? We have a really big problem in California, as do most of the states along the Pacific Coast, where we’ve let city votes control country wildlife: does a person who’s never set foot in the country except for perhaps an annual picnic local park have better knowledge about wildlife behavior and habitat than a biologist who spends 200 days a year tracking populations? According to the continued moratorium on hunting mountain lions, that only helps the ignorant sleep at night, but has actually led to more lions killed under depredation tags and the rancher’s Tripe S (Shoot, Shovel and Shut-up) than would have ever fallen to a hunter population carrying a mountain lion tag during a set hunting season. Until California gets its wildlife management practices under actual control of those who are paid to know what to do, i.e. the DFG biologists, we can at least we can do our part to help the deer population by thinning out the next largest predator population, the black bear, in California…and if what I’ve heard rumored is true, there might within a few years be a California bear hunting season with no limit as I enjoyed in Alaska—YES! THERE ARE THAT MANY BLACK BEARS IN CALIFORNIA…when you have bears, coyotes, and mountain lions coming down into heavily populated areas in search of food, it’s because their bigger brother kicked them out of their home area. And with something as tasty as black bear meat, I’m still perplexed as to why people continue to avoid putting them in the meat locker and cooking them for a fine meal. After all, up until the early part of the last century (the selling of wild game became illegal in 1918), black bear had an honored place on menus in the most respected restaurants of New York. For me, as I’ve been under the gun with the release of two new novels this year, the re-release of my 2004 bestselling Vietnam Prison memoir, The Bamboo Chest, in Kindle, and a new memoir (I call it the Marley & Me for combat veterans), bear meat has been a true source of comfort: it’s rich like an amazing beef steak, and yet sweet like pork. If you were to ask me my rating on meats, it goes this way from top to bottom: moose, black bear, antelope, wild boar, mule deer, blacktail deer…black bear, especially one that’s been feeding on manzanita berries or black berries, is that good! In the last few months, I’ve been doing a bit of experimenting. This might be my best bear steak recipe of all. 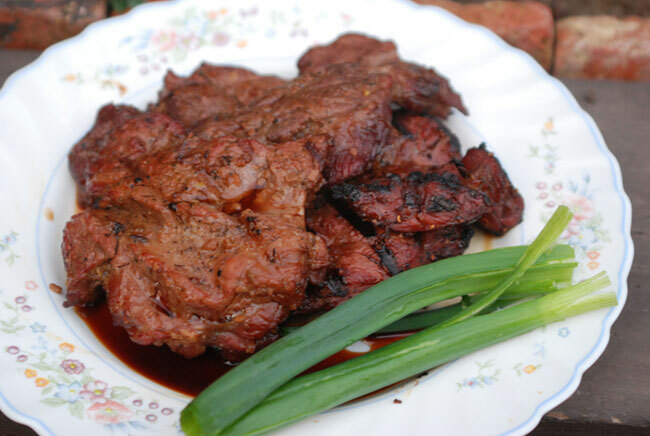 Yes, even better than my Scots Drambuie-Berry BBQ sauced black bear steak…It fits so well with what fellow hunter born under the sign of the archer Chef Marco Pierre White says, that food goes well served with what it eats. And what does a black bear enjoy most than honey? 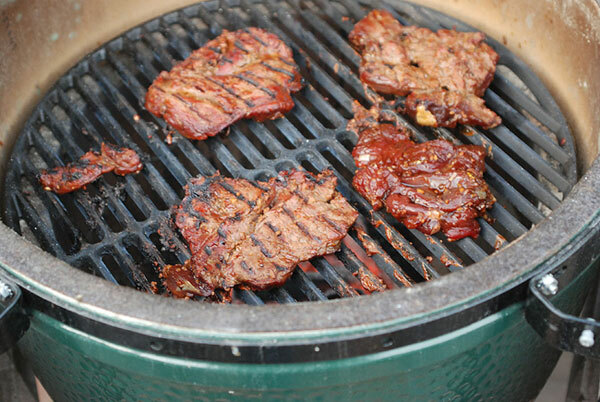 Khmer honey-marinated black bear steaks grilling on a Big Green Egg. 1. Put the bear meat in a large container and set a side. 2. In a blender, put garlic, green onion, soy sauce, oyster sauce, salt, honey and black pepper, blended well. 3. Pour the prepared marinade on the bear meat, mix well, cover it and refrigerate it over night, or at least 4 hours. 4. To grill, lay the marinated bear on the grill at a medium temperature, cook until meat tender and singed on both sides and there’s no pink juice leaking when you pierce the meat to test. A great carmelization will occur that seals in the juices and adds to its moistness, though cooked through. Because of the possibility of parasites in bear, you need to cook to a central temperature of 155 degree Fahrenheit. 5. Slice the steaks and serve them hot as an appetizer with rice, or wraps meat with rice noodle, lettuce, herbs and dip in the nuoc mam cham.